Scientists yesterday discovered a vast supply of gold on the far side of the universe. The extraordinary hoard is the result of a huge collision between two ultra-dense neutron stars. The resulting gravitational waves and radiation flash were picked up by powerful detectors and telescopes on Earth and in orbit. The explosion happened 130 million years ago in the Hydra constellation, which is so far away that the light and the ripples in space and time have only just reached us. The gold created by the blast is estimated to weigh more than the whole of the Earth’s mass. Huge quantities of platinum, uranium and other heavy elements such as lead were also created. Scientists not only 'heard' the phenomenon by measuring vibrations in space-time, they also used satellite and ground-based telescopes to see light and radiation pouring out of the stellar fireball, dubbed a 'kilonova'. 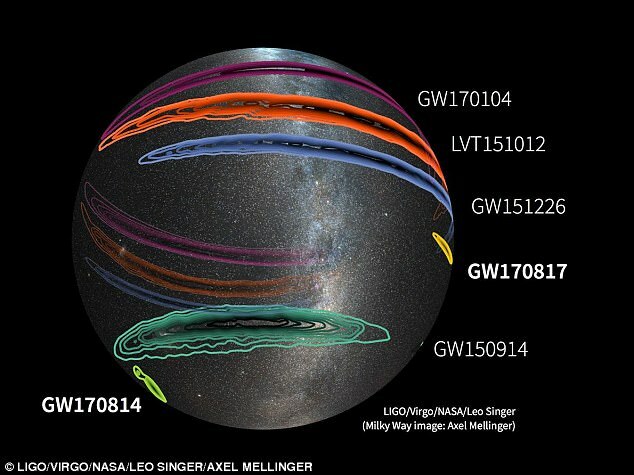 Excited astronomers talked of opening a 'new chapter in astrophysics' and unlocking a 'treasure trove' of new science. 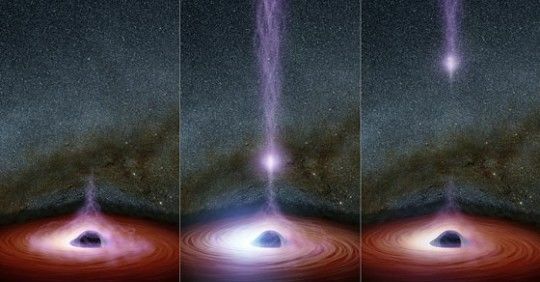 The discovery will help scientists better understand the inner workings and emissions of neutron stars, as well as more fundamental physics such as general relativity and the expansion of our universe. Every other gravitational wave detection has been traced to black holes crashing together in remote regions of the universe more than a billion light years away. The new event - though still very distant - was much closer and completely different in nature. It was caused by colliding neutron stars - burned out remnants of giant stars so dense that a teaspoon of their material on Earth would weigh a billion tons. Professor David Blair, a gravitational wave scientist at the University of Western Australia, said: 'I started working on the first high sensitivity gravitational wave detectors in the USA in 1973. 'We pinned our hopes on gravitational waves from neutron stars. This was our holy grail, but it eluded us even when gravity waves from black holes had been detected. 'Forty four years later we have found the holy grail!' The two objects, each about 12 miles in diameter, stretched and distorted space-time as they spiralled towards each other and finally collided. Like ripples from a stone thrown in a pond, the gravitational waves fanned out across the universe at the speed of light. They were picked up on Earth by two incredibly sensitive detectors in Washington and Louisiana run by the Laser Interferometer Gravitational-Wave Observatory (Ligo). It was here the first discovery of gravitational waves was made in September 2015, confirming a prediction made by Albert Einstein 100 years ago and earning three pioneers of the project a Nobel Prize. 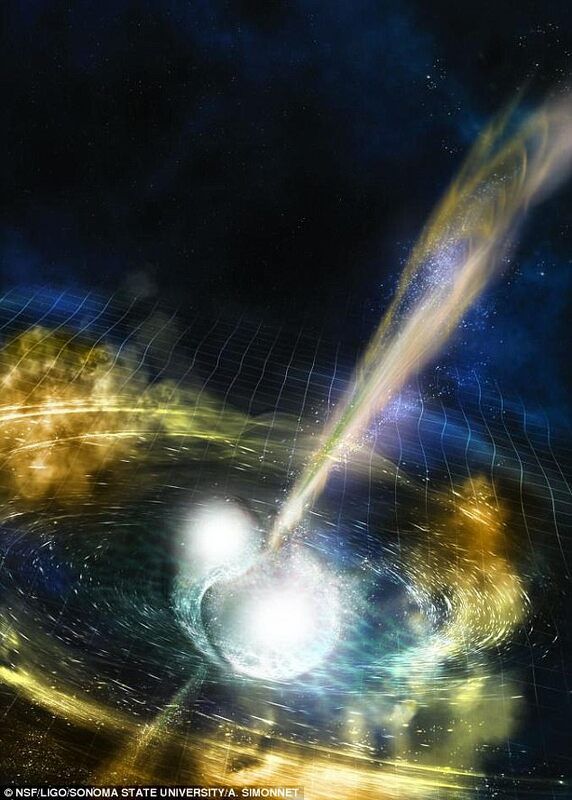 Two seconds after the Ligo detection, a burst of gamma rays from the neutron star collision was captured by NASA’s Fermi space telescope. After Ligo notified astronomers around the world of the possible detection of gravitational waves from the merger of two neutron stars, the race was on to detect a visible counterpart. This is because unlike the colliding black holes responsible for Ligo's four previous detections of gravitational waves, this event was expected to produce a brilliant explosion of visible light and other types of radiation. Astronomers around the world quickly turned their telescopes and dishes towards a small patch in the southern sky and saw a flash across the visible and invisible light spectrum. 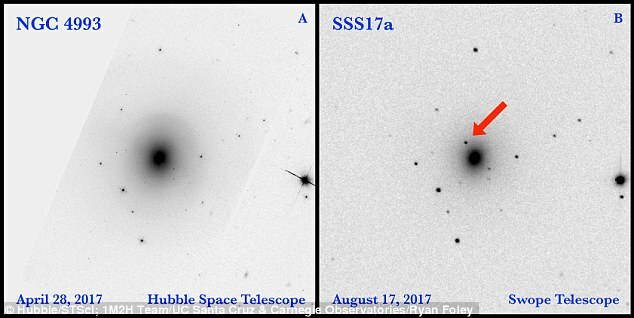 'This is a huge discovery,' said researcher Dr Ryan Foley, an assistant professor of astronomy and astrophysics at University of California Santa Cruz. 'We're finally connecting these two different ways of looking at the universe, observing the same thing in light and gravitational waves, and for that alone this is a landmark event. 'It's like being able to see and hear something at the same time.' Analysis of the light revealed something astonishing - the manufacture of gold on a cosmic scale, as well as other heavy elements. 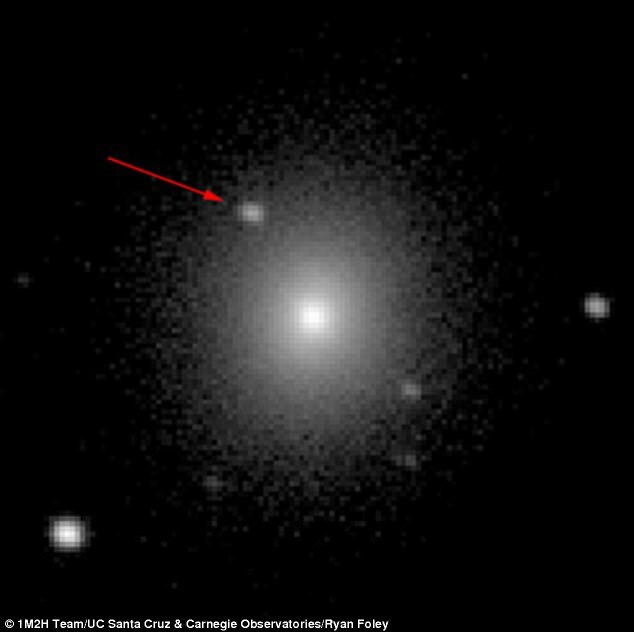 Dr Joe Lyman from the University of Warwick, one of many British scientists involved, said: 'The exquisite observations obtained in a few days showed we were observing a kilonova, an object whose light is powered by extreme nuclear reactions. The origins of gold and other heavy elements have been a long-standing mystery, but recent evidence has suggested colliding neutron stars could have a hand in their creation. A third gravitational wave facility called Virgo near Pisa, Italy, also registered a faint signal from the event, allowing scientists to triangulate its position. The neutron star collision took place 130 million light years away in a relatively old galaxy called NGC 4993. When the gravitational waves began their journey across space, dinosaurs roamed the Earth. The gravitational wave signal, named GW170817, was detected at 1.41pm BST (6.41pm ET) on August 17. Ligo's detectors, consisting of L-shaped tunnels with arms 2.5 miles (4km) long, use laser beams bouncing off mirrors to measure movement across a distance 10,000 times smaller than the width of a proton, the kernel of an atom. A tight lid was kept on the findings until the publication of a series of papers in journals including Nature, Nature Astronomy, and Physical Review Letters. The international researchers expect to spend many months trawling through the mountain of data. 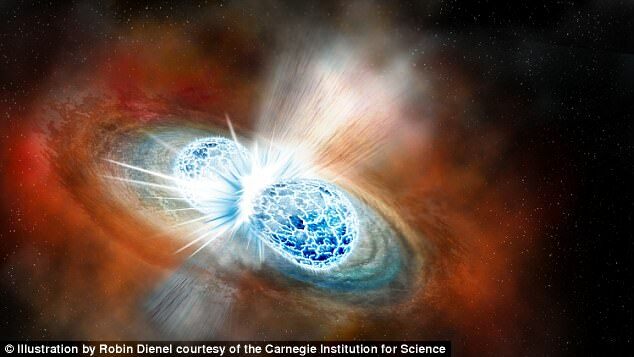 One finding relates to what happens during the merging of two neutron stars. The stars consist almost entirely of neutrons and are so dense that a sugar cube of neutron star material would weigh about a billion tons. The violent merger of two neutron stars ejects a huge amount of this neutron-rich material, powering the creation of heavy elements in a process called rapid neutron capture, or the 'r-process.' The radiation this emits looks nothing like an ordinary supernova or exploding star, and scientists have created many models to simulate the process. This is the first time one has actually been observed in such detail, and the data fits remarkably well with Another question already answered by the new data is the origin of short-duration gamma ray bursts. Gamma ray bursts (GRBs), marked by an eruption of gamma rays lasting milliseconds to several minutes, are the most powerful explosions known. 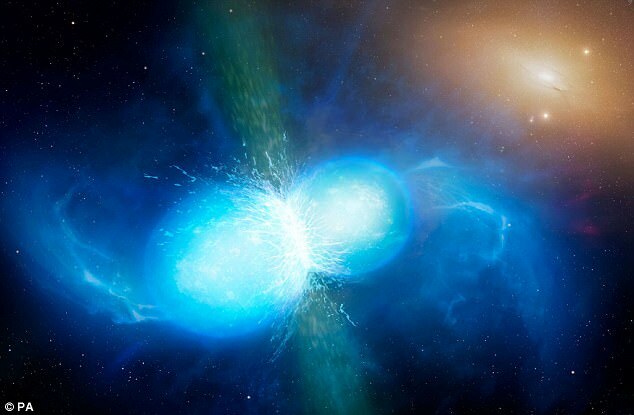 Scientists now know that one type of GRB is generated when neutron stars collide. Dr Samantha Oates, also from the University of Warwick, said: 'This discovery has answered three questions that astronomers have been puzzling for decades: What happens when neutron stars merge? 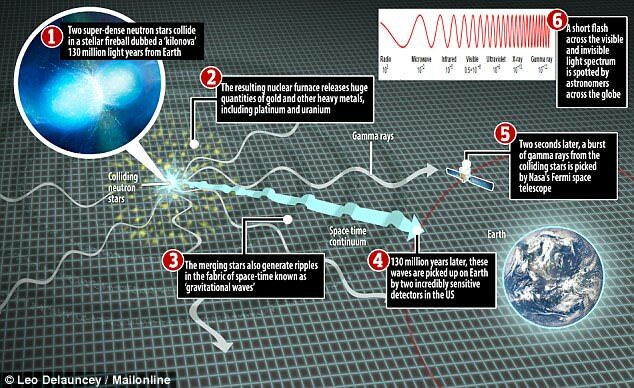 What causes the short duration gamma-ray bursts? Where are the heavy elements, like gold, made? British Ligo scientist Professor BS Sathyaprakash, from the University of Cardiff, described the new discovery as 'truly a eureka moment'. He added: 'The 12 hours that followed are inarguably the most exciting hours of my scientific life. 'This event marks a turning point in observational astronomy and will lead to a treasure trove of scientific results.' Professor Bernard Schutz, also from the University of Cardiff, told how his team used the gravitational wave detections to measure the expansion of the universe more accurately than had ever been achieved before. 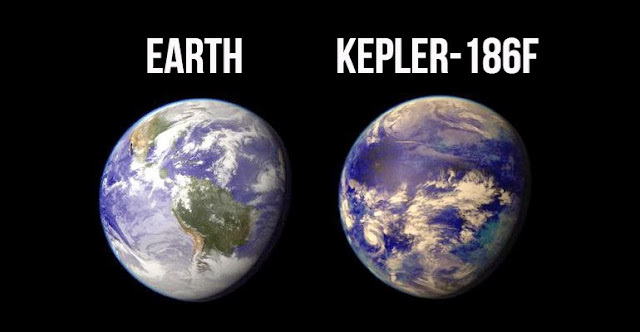 'What has amazed me ... is that with just this one measurement, we got a result right in the middle between the two rather different values that astronomers have measured recently,' he said. Dr David Shoemaker, spokesman for the Ligo scientific collaboration and senior research scientist at the US Massachusetts Institute of Technology's Kavli Institute for Astrophysics and Space Research, said: 'From informing detailed models of the inner workings of neutron stars and the emissions they produce, to more fundamental physics such as general relativity, this event is just so rich.